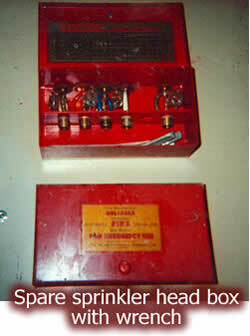 Inspection, testing, and maintenance of fire protection systems are comprehensive procedures. When completed, the fire safety procedures confirm that all sprinkler system components are in good condition and will ensure the system’s successful operation. Dry/Preaction/Deluge system Gauges—to ensure normal air and water pressures, and in wet pipe systems, to ensure normal water supply pressure is maintained. Control Valves—to verify the valves are in normal open or closed position, are properly sealed, locked, or supervised, are provided with appropriate wrenches and identification, free from external leaks, and accessible. Alarm Devices—to verify that they are free of physical damage. Hydraulic nameplate—to verify it is securely attached to the sprinkler riser and is legible. Pipe and fittings—shall be in good condition and free of mechanical damage, leakage, corrosion, and misalignment. Sprinklers under an exposed ceiling shall be inspected from floor level to verify that there are no signs of leakage, corrosion, foreign material, damage, and in the improper orientation. Glass bulbs shall be replaced if necessary. Spare Sprinkler—shall be inspected for the proper number and type, and provided with the appropriate wrench. 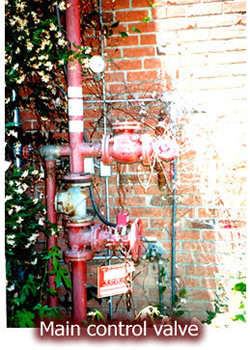 Visible and Accessible Fire Department Connections—to verify the couplings/swivels are not damaged and rotate smoothly, plugs, caps and gaskets are in place and in good condition, identification signs are secure, check valve is not leaking, automatic drain valve is in place and operating properly, and any FDC connection clappers are in place and operating properly. Alarm Valves—exterior inspection to verify that gauges indicate normal supply water pressure is being maintained, valve is free of physical damage, in the appropriate open or closed position, and retarding chamber or alarm drains are not leaking (an interior inspection is done every 5 years). Dry Pipe Valves—exterior inspection to ensure the valve is free of physical damage, all trim valves are in the appropriate open or closed position. Preaction/Deluge Valves—exterior inspection to verify there is no physical damage, trim valves are in the appropriate open or closed position, valve seat is not leaking, and electrical components are in service. Pressure Reducing Valves—are in the open position, not leaking, maintaining downstream pressure in accordance with design criteria, in good condition with handwheels installed and unbroken. Backflow Preventers—the double check assembly and the double check detector assembly valves shall be inspected to ensure that the OS&Y isolation valves are in the normal open position. Buildings—to verify that adequate heat is available to avoid freezing of any water-filled sprinkler piping. Antifreeze Solution Test—to determine the solution’s freezing point by measuring specific gravity with a hydrometer or refractometer and adjust the solution if necessary. Sprinkler Pipe Hangers and Seismic Braces installed under an exposed ceiling shall be inspected from floor level. Alarm Devices—water motor gongs, pressure switch type, & vane-type shall be tested. Wet pipe systems shall be tested by opening the inspector’s test connection, (except in freezing conditions where the bypass connection shall be used.) Testing dry pipe/preaction/deluge systems shall be accomplished by using the bypass connection. Main Drain Test—shall be conducted at each water-based FP System Riser to determine a change in condition of the water supply piping and control valves. Systems where the sole water supply is through a backflow preventer or pressure reducing valves, the main drain test of at least one system downstream of the device shall be conducted. Control Valves—for accurate position and operation through its full range and then returned to normal position. Preaction/Deluge Valves—priming water, low air pressure alarm, and full flow trip test. Dry Pipe Valves/Quick Opening Devices—priming water level, low air pressure alarm, quick-opening devices (if provided), trip test (during warm weather), and low point drains shall be evaluated and drained after each operation & before the onset of freezing conditions. Hangers, Seismic Braces, Pipes & Fittings, Sprinklers—shall be evaluated which are installed in accessible concealed spaces such as above suspended ceilings. Preaction/Deluge/Dry Pipe Valves—the interior shall be inspected when a trip test is conducted. Check Valves—interior inspection to verify that all components operate correctly and are in good condition. Gauges—shall be tested every 5 years by comparison with a calibrated gauge. Gauges not accurate to within 3 percent of the full scale shall be recalibrated or replaced. Pressure Reducing Valve—a full flow test shall be conducted on each valve and compared to previous test results. Fire Department Connection—shall be backflushed at full flow. replaced or representative samples from one or more areas shall be tested, and retested at 10 year intervals. Sprinklers that have been in service for 75 years shall be replaced or sent to a recognized testing lab acceptable to the AHJ for field service testing, with retesting at 5yr intervals. 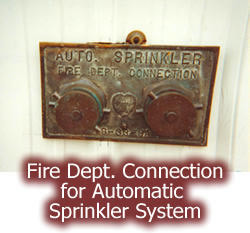 Sprinklers manufactured prior to 1920 shall be replaced. 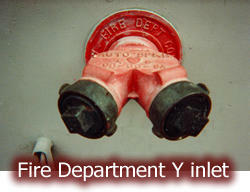 Contact A-Total Fire Protection to schedule your fire sprinkler system inspection!